Pressure washers are becoming a standard piece of household equipment – and for a good reason. Pressure washing offers various benefits, along with cleaning possibilities that these power tools provide. Using the regular garden hose to wash that grime and muck off of your porch will work only so far. That`s the moment people start considering getting a reliable pressure washer. In order to choose the best fit, we have analyzed some of the most sought-after units in these Generac power washer reviews. When speaking about reliable and powerful pressure washers, Generac is a brand that stands tall in this field. 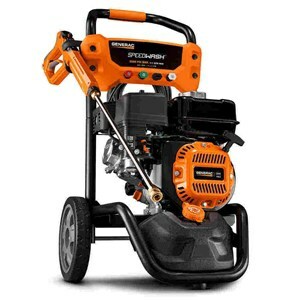 We have prepared Generac pressure washer reviews in which we will try to analyze the three most notable models. The very first on our list is the gas-powered OneWash model. It packs a punch of 3100 PSI with 2.8 gallons per minute. This particular pressure washer comes with a function of changing the PSI from delicate (which comes around 2,000 PSI) to heavy-duty power mode (around 3,000 PSI). This system is called the PowerDial, and it is there to help you adjust the pressure you need for the task at hand. With the cleaning power of 7400 (PSI x GPM equals the total cleaning power), you can easily do medium and heavy cleaning tasks. This pressure washer is powered by a 212cc OHV engine. Although powerful as it comes, it is designed to wash surfaces with cold water. This power does come with a price – powerful power washer units can’t be light in weight. Generac OneWash weighs about 68.6 pounds, but it’s easily transported around with its large 11-inch wheels. A 30-inch high-pressure hose is ergonomically designed so you can clean your yard without breaking a sweat. This model also has an easily accessible ½ gallon detergent tank, so you won`t have the need to refill it so often. This unit comes equipped with 3 quick-change nozzle tips: 0-degree, 25-degree and soap dispenser. This model made by Generac is slightly less powerful, but it was designed to be ergonomically superior. What separates it from the previous model is the cushion grip handle which increases the comfort of using the washer while reducing fatigue from carrying it at the same time. The 6922 model is packed with a 196cc Generac OHV engine which produces 2800 PSI at 2.5 GPM, giving it the final cleaning power score of 6720. Even though Generac presents itself as a power-tool company, this model has a slightly less robust design and is more convenient for storing. The 10-inch never-flat wheels combined with the abovementioned handle really give you the mobility to get the work done. This model comes with 4 nozzle tips (0-degree, 25-degree, 40-degree and the soap dispenser) that are easily attached. It also comes with a ½ gallon soap tank and a 25-foot high-pressure hose. Now, this is the model that stands from the Generac pressure washer family. For starters, it also has the PowerDial to help you change the water pressure output, but on this model, it is located on the nozzle itself. You can change the pressure even while washing. However, the 7122 comes with several additional features that its predecessors don’t offer. The SpeedWash unit has a 3200 PSI power output, with 2.7 GPM, and it has the 196cc Generac gas-powered engine. The total cleaning power of this mighty power washer is a staggering 8640. 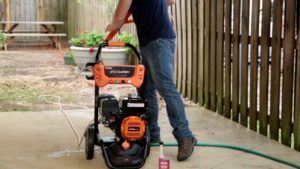 Besides the standard gear that Generac offers with their pressure washers, this model has additional equipment that makes cleaning easier and more focused. First, there is the PowerBroom and an attachment that contains high-pressure nozzles that help you focus the cleaning power on a single area and clean 4 times faster. Then, there`s the TurboNozzle with the pinpoint system to help you clean even the most persistent stains. Last, but not least, there is the SoapBlaster attachment which provides additional soap spraying option for deeper cleaning. The 7122 SpeedWash model also comes with never-flat wheels and 4 additional angled nozzles. With this unit, you also get a 30-feet long flex hose, that is kink resistant and doesn`t get stuck that easily. You can use this unit to prepare surfaces for paint jobs, strip the previous paint layers, wash your concrete driveway and anything in between. As you can easily conclude from the Generac company motto (`Our business is power`), this company is not joking when it comes to making reliable power tools. Founded in 1959, Generac started as a company that focused on the development of generators, specifically ones intended for home use. Pioneering the industry of home standby generators, Generac slowly but surely climbed to the #1 spot when it came to manufacturing home generators. The company`s R&D departments are known for pushing the boundaries when it comes to power generators. They have had multiple successful innovative designs, such as the famous Magnum line, and they have developed power solutions used all around the globe. Generac provides creative solutions like mobile, trailer-mounted generators and they even supply several branches of various industries with their innovative design. In the game of power washers, Generac has played a meaningful role when it comes to commercializing and making pressure power washers available and affordable. They insisted on the fact that heavy-duty power machinery should be available to everyone who wishes to wield it, and should be suited to match their needs. As you have probably noticed, Generac pressure washers are all packing more than 2500 PSI. The company perfected the art of utilizing gas-powered engines in order to produce the optimal amount of cleaning power. Their pressure washers are so powerful that, at first glance, they give off the impression of cleaning units manufactured for industrial use. 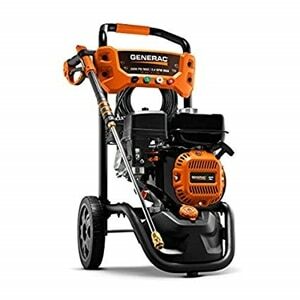 Generac pressure washers are also heavier and more robust, but it all makes perfect sense if you think about the power output they provide and the quality of their frame. Even though Generac pressure washers are on the heavier side, the company had mobility in mind and made sure the units are easy to handle. These pressure washers are widely used by the professionals and homeowners and are very affordable despite the fact that they are quite powerful. The company succeeded in creating powerful pressure washers and budget-friendly units that can perform light, medium and heavy cleaning tasks. You can tackle any surface, from gentle wood, fragile grass to granite and concrete. Generac website is a useful source of helpful information. Not only will you find every technical specification on the website, but you can browse through their great instruction videos as well. Explained and demonstrated in a simple easy-to-understand manner, they also provide comparison videos where pressure washers are tested and experimented with. Furthermore, their customer support is made of professional staff, and their return policies are made very well. The company prides itself on superior customer service and they tend to uphold the reputation. 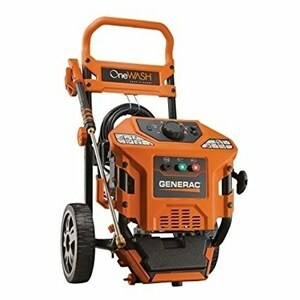 Generac, as a heavy-duty power washer manufacturer provides quite powerful pressure washing machines for all types of cleaning. The industrial design matches the power output, and the units are easy to use and assemble. If you check our Generac pressure washer reviews and choose any model cited above, you won’t regret your decision. By introducing the PowerDial, the company showed that its pressure washers can pass every obstacle that you put in front of them. Just keep in mind that they are a bit heavier than your usual pressure washer, but power comes at a price. This brand is a perfect choice if you need a powerful machine in your household to finally get those nasty stains off of the driveway. If your needs are different, you can start over from our homepage.